And finally, summer reaches London! Always a fantastic time to explore the Capital, with so many wonderful activities and events on offer – from alfresco dining through to one of the world’s greatest classical music festivals, the BBC proms. This week’s Poster of the Week celebrates summer nights in London. Designed by Vladimir Polunin in 1930, it promotes the Tube’s services as extending beyond the daily commute, enticing passengers to discover the glamour and excitement of London’s nightlife. Born in Moscow, Polunin studied in St Petersberg, Munich and Paris before becoming a chief designer for the Russian Ballet and later Opera, along with teaching at the Slade School in London. Such a varied cultural background made Polunin an excellent choice of artist to depict London’s cultural highlights. 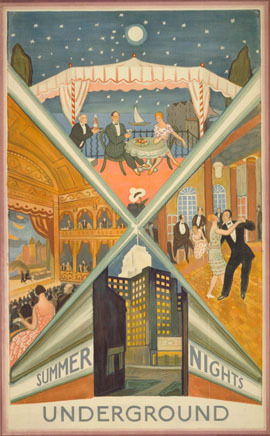 Interestingly, this poster also features the Underground’s headquarters at 55 Broadway, designed by Charles Holden. An impressive example of modernist architecture, it was the tallest office building in Westminster when it opened in 1929. Its inclusion in the poster design adds to the portrayal of a modern, dynamic, bigger and brighter London.